In this most common type of disability claim, long-term coverage is provided through an employer group disability insurance policy or through an employer self-funded plan. This type of coverage is regulated by federal law, known as ERISA, which stands for Employee Retirement Income Security Act. Unfortunately, ERISA law clearly favors insurance companies, and falls short in protecting the rights of the disabled. For example, you are not entitled to have your case tried before a jury—usually these cases are decided by a judge based upon the written evidence in the insurance company’s file. Furthermore, you can not get compensatory or punitive damages. Federal law applies to these types of disability claims and as a result, most ERISA cases are filed in federal court. Although California has passed numerous regulations to keep insurance companies from acting in bad faith and wrongfully denying these types of claims, ERISA law more likely than not will preempt California law, thereby protecting and shielding the insurance company for their wrongful conduct. Regarding an issue of state versus federal law, in 1999 our firm successfully represented a disabled client, taking the case all the way to the United States Supreme Court (Link to Ward decision). We are proud to say that not only did we win this case on behalf of our client, but we also played a key role in making it easier for states to relax some deadlines imposed by group insurance companies for the filing of disability claims. Our firm has a proven track record and the experience and expertise to aggressively represent you. You must complete the administrative process of your claim, through the Appeal process, before you can file an action in court. Early consultation with an attorney allows him or her to make sure that your file (administrative record) contains the appropriate documents necessary to prove your disability claim in court. Evidence to support your claim of disability must be included in the administrative record with the group insurance carrier either at the initial filing of your claim or at the Appeal stage. The evidence that you are allowed to present in court is usually limited to the administrative record, so you can not testify nor can you have any witnesses, such as your spouse or doctor, testify to support your claim. At a minimum, the medical evidence in your administrative record should contain a certification from your treating doctors outlining the limitations and restrictions on your physical abilities that render you totally disabled. It is also helpful for you to submit, by way of a personal declaration, your limitations and restrictions. If we are involved early enough in the administrative process of your claim, we will work to insure this evidence and all relevant evidence is in your file. It is a good practice to clearly record all documents sent to the insurance company (keep a listing along with a copy), and serve them by way of certified mail/return receipt. This practice gives you proof of the evidence that you have provided to be included in your insurance file/administrative record. Most group disability insurance policies require that you also file for Social Security Disability Insurance (SSDI) because the long term disability carrier is entitled to offset any money that you receive. 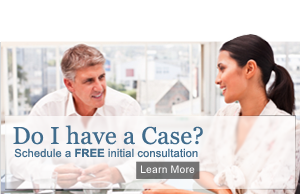 We also handle SSDI claims. We will be happy to represent you should your claim for SSDI be denied. ERISA regulations impose strict deadlines and procedural requirements that must be adhered to. It is not unusual for someone to loose their case for not following the ERISA rules and procedures.